Make sure your kids are immunised against measles. It takes around 2 weeks for the immunisation to protect you. Felicity Lyme, who caught measles during the 2011 outbreaks, talks about what the disease is like. If you think your child might have measles, phone Healthline on 0800 611 116 or your family doctor as soon as possible for advice. Measles can be a serious disease. It's caused by a virus. Measles spreads very easily from one person to another. Measles is also known by the names morbilli or rubeola. Measles is the most common vaccine-preventable cause of death among children throughout the world. It usually takes 10 - 12 days from contact with someone with measles to the first symptom appearing but it can take from 7-18 days. This is called the incubation period. You can sometimes see small white spots (Koplik spots) inside the mouth near the back teeth early in the disease, as in the photo. A rash follows and the white spots inside the mouth fade. The rash appears on the head and gradually spreads down the body to the arms and legs, as in the photos. It lasts for up to one week. A person who has measles is most infectious in the early stages of their disease - from 5 days before the symptoms first appear to 5 days after the appearance of the rash. 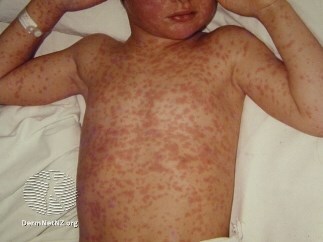 Children usually look and feel quite unwell and miserable with measles. They are most unwell during the first day or two after the appearance of the rash. 1 in 10 people with measles will get complications. 1 - 3 out of 1,000 people with measles will die in developed countries. Measles in pregnancy increases risk for premature labour, miscarriage and stillbirth. 1 in 1000 people with measles develop inflammation of the brain (encephalitis ) - 15 in 100 of these people die and approximately 30 in 100 are left with permanent brain damage. 1 in 100,000 people who have had measles will, years later, develop a serious brain inflammation called subacute sclerosing panencephalitis (SSPE). This serious complication always results in death. Who is most at risk of complications from measles? Measles is very easy to catch. It spreads through the air by infectious droplets through coughing, sneezing and talking, or by touching a surface with infected saliva or mucus. Who is most at risk of catching measles? Can I do anything to prevent my child catching measles? See the page about measles immunisation. Immunisation given on time is the only way to prevent measles. 2 doses of the measles, mumps, rubella (MMR) vaccine is 99 percent effective in preventing measles. See the page about measles immunisation on this website. Phone Healthline on 0800 611 116 or your family doctor as soon as possible for advice. Make sure to phone your doctor before visiting. That way they can take steps to make sure you don't wait in a public area where other people might catch measles from your child. How do I prevent measles spreading? You should only see people who are immune to measles when you are in isolation. Your child will need to stay in isolation until they are no longer infectious. The infectious period usually ends 5 days after the appearance of the rash. Your public health service or family doctor should give you advice about this. They should also give advice to people who have been in contact with your child and are at risk of catching measles. Because measles is caused by a virus, there is no specific treatment. Antibiotics are not helpful for measles and your doctor won't give them to your child unless your child also develops a bacterial infection as a complication of measles. In severe cases of measles, particularly when there are more serious complications, hospital treatment may be necessary. How can I care for my child with measles at home? When should I seek help for my child with measles? When do I need to see a doctor urgently? The photo of the small white spots (Koplik spots) inside the mouth is reproduced courtesy of the Centers for Disease Control and Prevention, US. 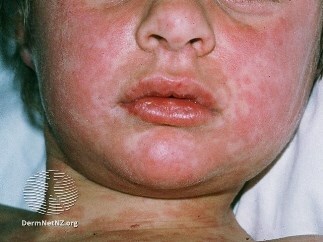 The 2 photos of a boy's face and body with the measles rash are reproduced courtesy of DermNet NZ.